Space Patrol Luluco is an anime from the well regarded anime studio, Trigger. The television series was created by Hiroyuki Imaishi. The series aired in Japan between April and June 2016. He is frozen and even dropped by his daughter, breaking in three pieces. She quickly and frantically rushes her father to the Space Patrol headquarters. Luluco meets with the chief of the Space Patrol Ogikubo branch, he offers her a job, in exchange for defrosting her father. She doesn’t want to join the force, but is tasks with policing her middle school of “crime.”Her first case was an incident of cheating by a fellow student. Her patrol suit is automatically activates and she transforms into a Judgement Gun, garnering the laughter of her classmates. 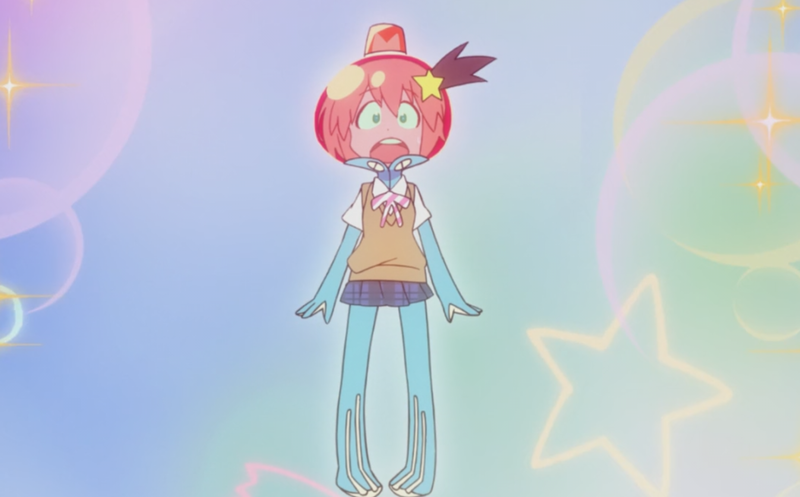 The animation of Space Patrol Luluco is dynamic. The characters have a chibi feel to them. The color pallet of the series is vast, and the characters move through public environments that are stationary and less colorful. This is most notable when Luluco is talking to the chief. He wasn’t moving very much, save for his purple flame. The series is silly and comical in tone. The character design of the aliens are simple, and there’s nothing unique in their appearance, but I liked them. The episodes of this series are only 7 mins. long. I was initially disappointed by the length, but I found that it is probably a good thing. I’ll continue to watch this series and hope it continues to interest me.